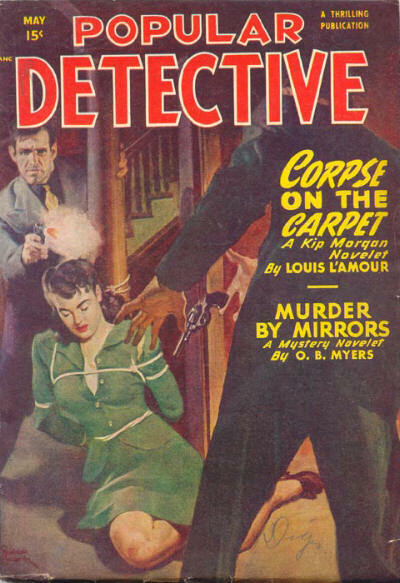 THIS ONE IS very miscellaneous indeed, comprised as it is of dribs and drabs that we've stumbled across in our random walk through the Interblab searching for vintage information about detective and crime fiction. One possible justification for highlighting them is the window into the life and times of our predecessors which such an approach affords, so you could regard it as of historical interest, if nothing else. Interestingly enough, however, we can't help noticing that even after a hundred years some things never change . 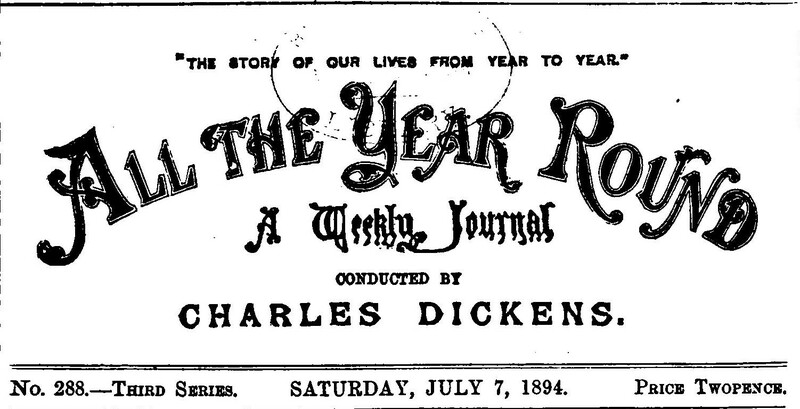 . .
First appearance: All the Year Round, July 7, 1894. Online at Hathi Trust (HERE). "The detective story has its separate art. It must practically be invented backwards. That is to say, the author must start from the conclusion and work out his clues, his false scents, and his wild-goose chases till he gets to the beginning. Then he is in a position to open his first chapter and have a fair run till he reaches earth." — Mr. Marriott Watson in the Daily Mail. Quoted in The Book Monthly (1903/4; HERE). "Is there a product of romance so essentially a creature of the imagination as the detective of popular fiction? It is not that his exploits are more remarkable than the Real Thing, but his personality soars so much higher." — The Sunday Sun, London. Quoted in The Book Monthly (1904/5; HERE). "There are some kinds of fiction which have a greater chance of surviving than others, and the detective story is one of them. Take, in proof of this, Miss Anna Katharine Green's story, The Leavenworth Case. It was published a full quarter of a century ago, but it still sells merrily. 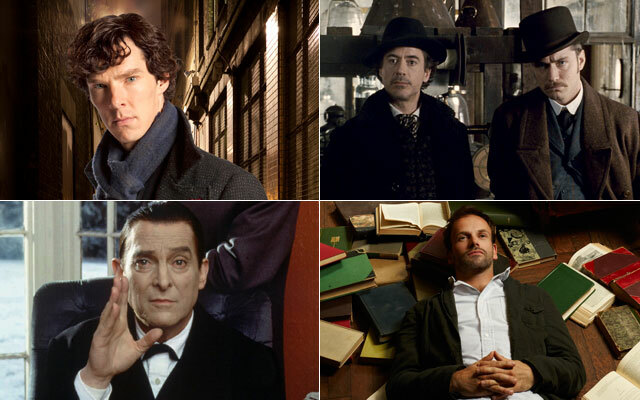 Twenty-five years hence 'Sherlock Holmes' will be exciting a new generation of readers." — Anonymous, "Personal and Particular," The Book Monthly (1904/5; HERE). mon with the qualities that make up a literary masterpiece." — The Tribune. Quoted in The Book Monthly (1905/6; HERE).
. . . to which we add: Provide objective definitions of "literature" and "literary masterpiece." 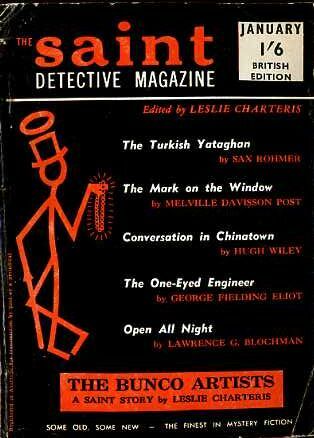 "A third work of fiction is from the pen of Mr. Robert Machray, and is called The Private Detective. As the title suggests, it is a highly sensational tale, but the delineation of character has not been sacrificed to a mere plot, however 'thrilling.'" 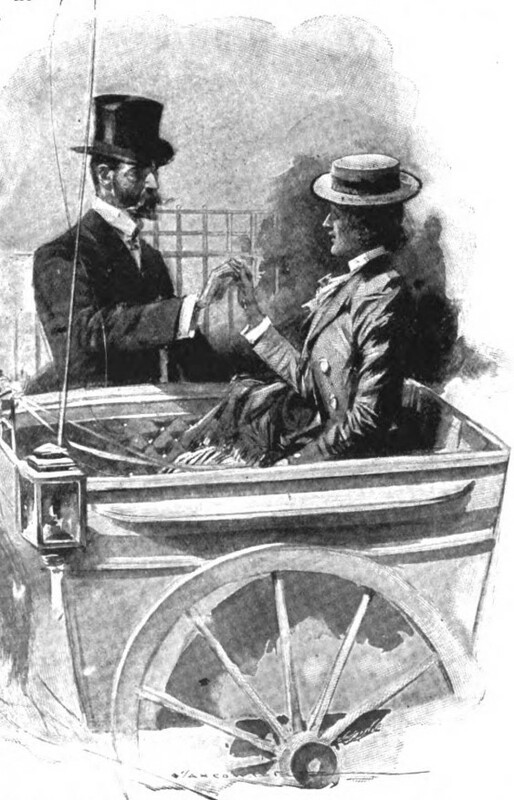 — "New Books Nearly Ready," The Book Monthly (1905/6; HERE). - ONTOS posts about Machray are (HERE) and (HERE). The old argument about character vs. plot is obviously a lot older than we thought. By C. E. Lawrence (1870-1940; HERE). 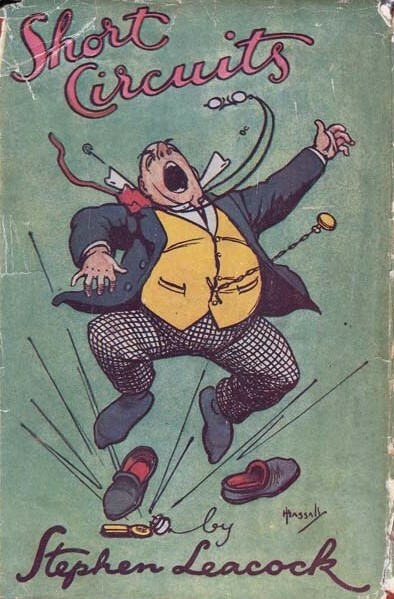 First appearance: The Book Monthly, March 1912. ~ The Mystery of the Ravenspurs (1911) by Fred M. White (1859-1935). Fred White bio-bibliography is at Roy Glashan's Library (HERE). ~ The Secret Tontine (1912) by R. Murray Gilchrist (1868-1917). Gilchrist Wikipedia article is (HERE). ~ The Triangle (1912) by Marie Connor Leighton (1865-1941). Bear Alley's article about Leighton is (HERE). ~ The Mystery of Nine (1912) by William Le Queux (1864-1927). Le Queux Wikipedia article is (HERE); the GAD Wiki entry is (HERE). ~ The Ruby Heart of Kishgar (1912) by Arthur W. Marchmont (1852-1923). Edwardian Review's short article about Marchmont is (HERE). OUR CRITIC isn't condemning detective fiction here, just BAD ("second rate") detective fiction. This one should be of interest to anyone who cares about the genre. "Villains! O Where and O Why Have They Gone?" 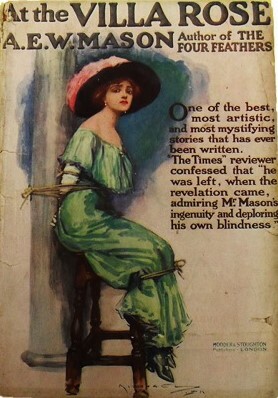 First appearance: The Book Monthly, September 1913. 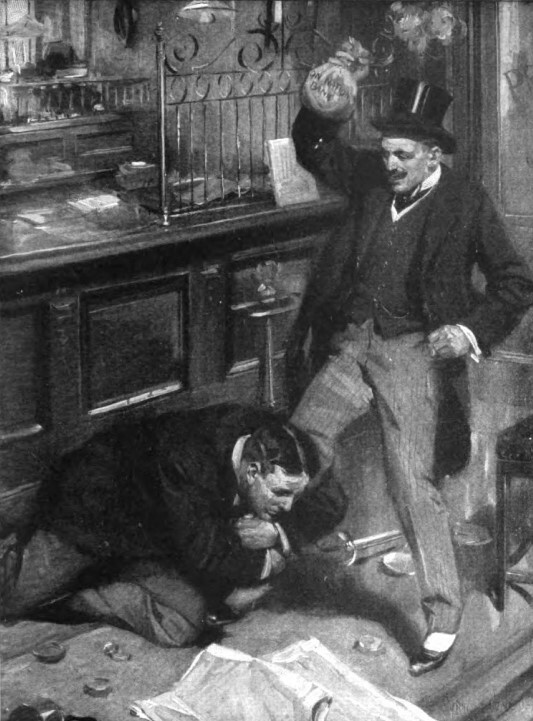 AS FAR as really bad guys are concerned, our critic thinks the advent of Sherlock Holmes "hastened the deterioration" of true villainy—or does he have his tongue-in-cheek? First appearance: The Atlantic Monthly, 1911. Book reviews article (1 page highlighted). "In placing the poorer work of some of our contemporary authors side by side with the better, one is sometimes inclined to cry out against the age for the way in which it drags down talent. Why does the author of Peccavi turn to writing clever but mischievous tales of burglar life? Why does the man who could create The Four Feathers begin to write mere detective stories? That earlier book was a genuine contribution to art, an unusual interpretation of human character, worked out through a plot which kept alive the finer sort of suspense that comes from wondering which way the human will will turn. Countless people are writing detective stories; many can write them worse, and some can write them better than Mr. Mason does. To readers of this species of fiction, who enjoy the clever processes of reasoning by which, in logical succession, the many wrongfully suspected people are eliminated, and attention is fixed on the guilty one, it will prove a disappointment in this story to find that [SPOILER IN TEXT DELETED]. There proves to be [SPOILER IN TEXT DELETED], but the artistic as well as the ethical balance is better when [SPOILER IN TEXT DELETED]. 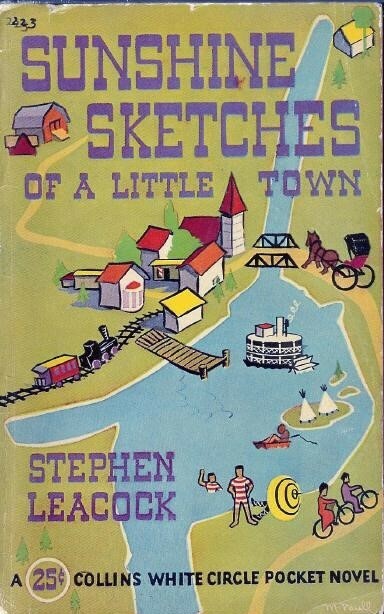 Interesting as the book is in many ways in its foreign setting, one cannot help wishing that Mr. Mason would leave to lesser people the mystery and murder stories, and express in his earlier manner his rather remarkable insight into character and his subtle moral sense." - Wikisource tells us about Margaret Pollock Sherwood: "American author, feminist and Professor of English at Wellesley College, 1889-1931. Pen names: Margaret Sherwood, Elizabeth Hastings." - See the ONTOS article (HERE) and follow the links therefrom; other Mason works are highlighted (HERE) and (HERE). 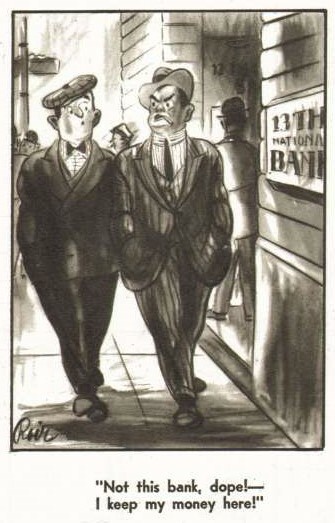 "The Coup Had Been Cleverly Engineered, and Was Bound to Succeed"
"A Grand Coup: The Bank Manager's Adventure." By Huan Mee (Charles H. Mansfield, 1864-1930, and W. E. Mans-field, 1870-1916). 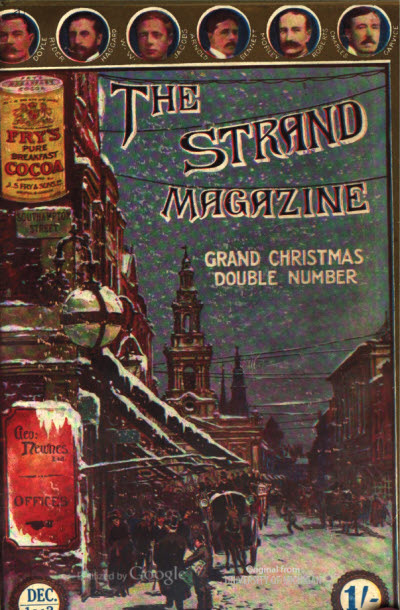 First appearance: The Harmsworth Magazine, September 1900. 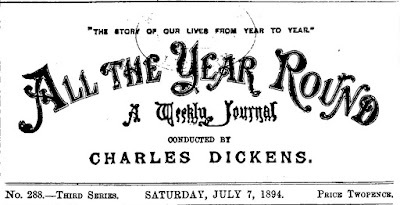 Reprinted in Home Cheer: A Family Journal, May 1901. Short short story (8 pages, 5 illos). "There was another factor yet to be dealt with, unlooked for, unexpected, and therefore uncalculated . . ."
Knocking over the Great Central Bank of Lombard Street should be a relatively easy affair, and it would be except for, believe it or not, the hue of a flower . . .
". . . two well-dressed men were waiting apart from the other people on the platform—silk-hatted, frock-coated, prosperous-looking individuals, with, to a keen observer, just a tinge of nervous excitement in their faces." 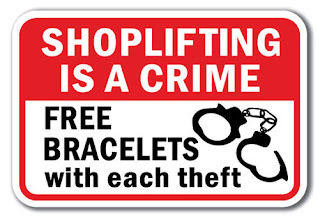 "Don't let me be branded a thief, as I shall be." "Stop him! That man has my purse." - We've featured stories by "Huan Mee" several times already; see the page (HERE) for those. "With More Than a Hundred Witnesses, His Alibi Could Not Be Broken"
By Sydney J. Bounds (1920-2006). 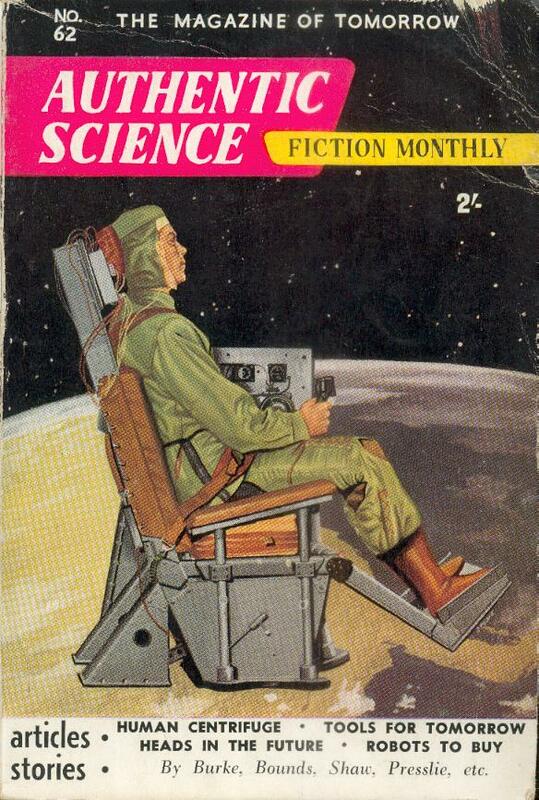 First appearance: Authentic Science Fiction, October 1955. Short short story (9 pages). "I have committed the perfect crime. Naturally I want you to know—now that you can’t do a damn thing about it!" Alibi-breaking is stock-in-trade for the average police detective, but a major brain-bender of a problem awaits Inspector Burton of the C.I.D. in re the case of Gerald Laver, deceased . . .
"Gerald Laver, age sixty-three, financier, bachelor, lived alone except for one servant. Shot through the heart from a distance of three yards by a .45 automatic—that's the gun on the table—died instantly. 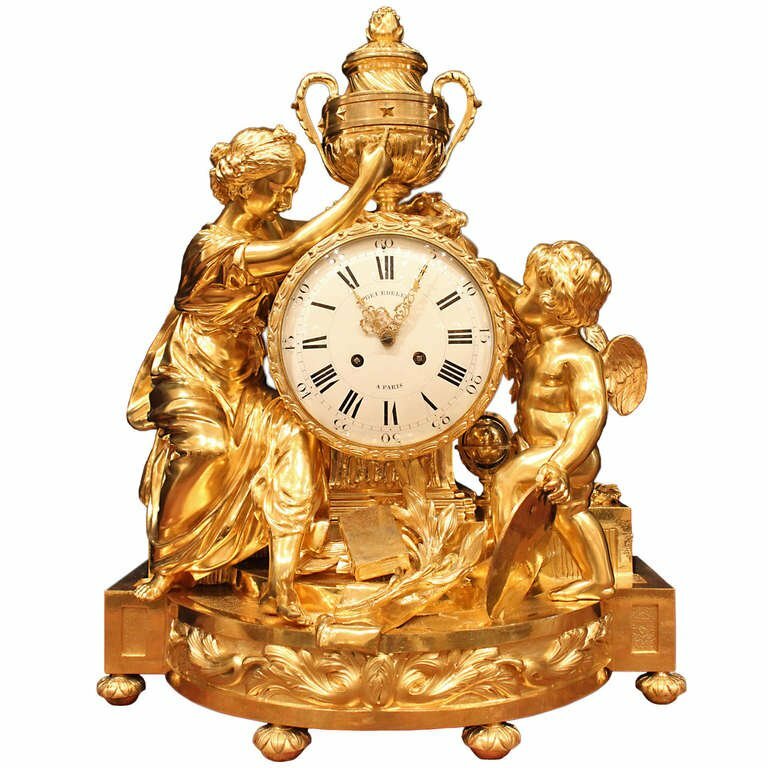 Time of death established by medical evidence, nine to nine thirty p.m. Wrist watch smashed and stopped at nine twenty-one p.m."
". . . stared glumly at his desk and wondered how the gun that had killed Laver could clearly show Webb’s finger-prints, and no others, if Webb had not been the last man to handle it. He already had a headache from thinking about that." "After you’d left Laver’s house, I was alone with the corpse, waiting for the mortuary van to come. It was quiet in that room. Just me and the deceased—then, all at once, there was this rabbit." Comment: If the killer hadn't had the urge to brag, thus saving the Inspector from having to figure it all out by himself (highly unlikely), this story could easily have been ten or twenty times longer. SFE (HERE), and the ISFDb's bibliography (HERE). 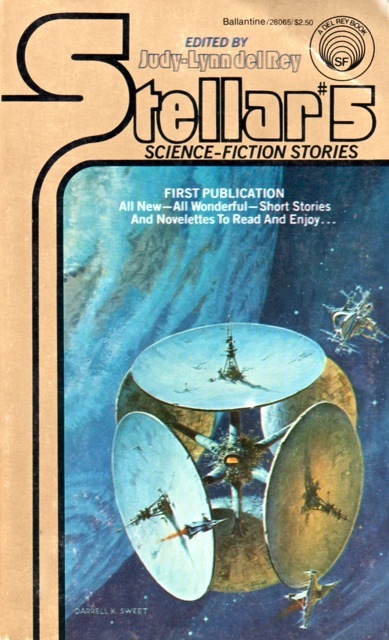 - It's remarkable how many authors have mashed crime and Professor Webb's technology together; the latest such story that we've featured on ONTOS is Milton Lesser's "Stop, You're Killing Me!" (HERE); two other similarly themed stories are highlighted (HERE) and (HERE). "He Didn't Bother to Look Too Carefully When He Didn't See It"
HERE WE HAVE two stories by the same author about how smug killers who think they've committed the perfect crime haven't . . .
By David X. 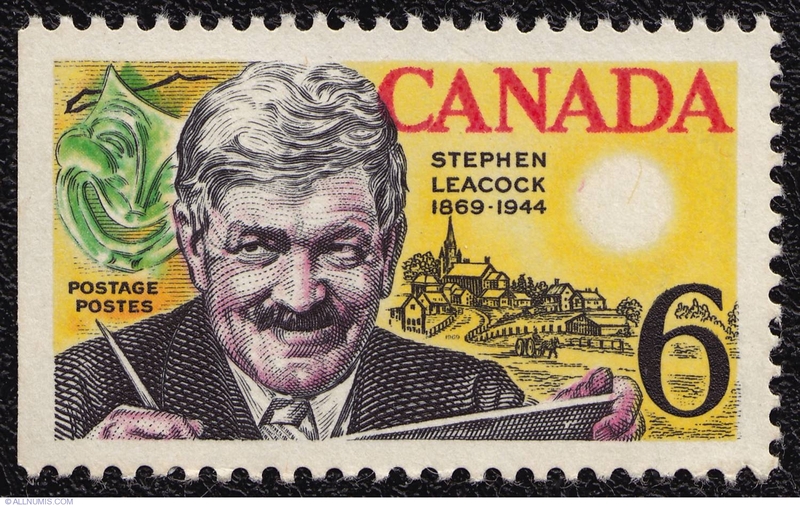 Manners (1912-2007). 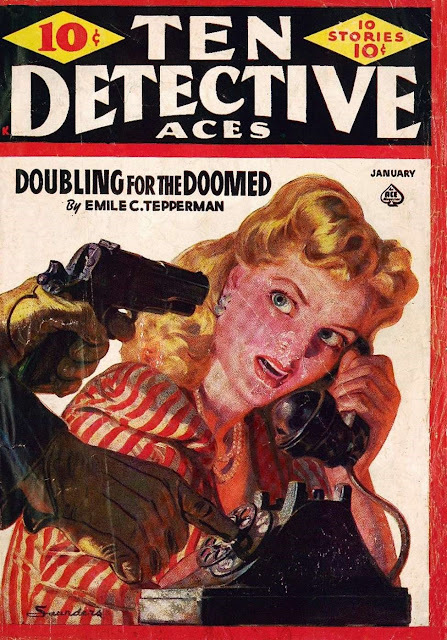 First appearance: Ten Detective Aces, January 1943. Short short short story (4 pages). Online at Comic Book Plus (HERE; select page 98 from the dropdown menu). "Fingerprints don't lie—but sometimes they bear testimony that is subject to change without notice." with the electric chair is manifested in red, red as in redhanded . 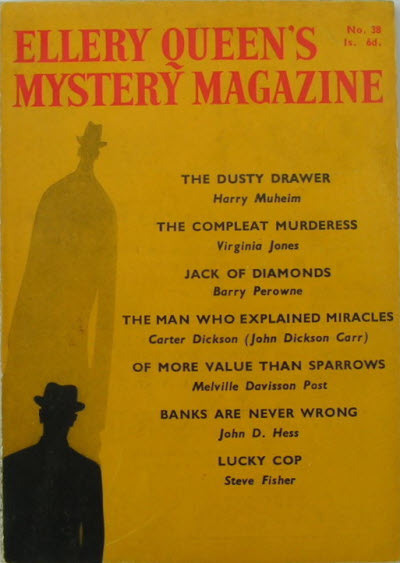 . .
First appearance: Popular Detective, May 1948. "Detective Carter lets a hunch lead him to a killer!" This policeman is sure he's got the killer; the killer is sure he's thought of everything. We leave it to you to predict just who's right . . .
beg everyone's forgiveness for overlooking it and unjustly libeling the writer. - Says FictionMags about our author: "According to his son Tim he wasn’t actually 'David X. Manners' but was 'David X Manners' as the 'X' was his whole name and not an initial." "His enemy was escaping—and he had a missile in his hand." 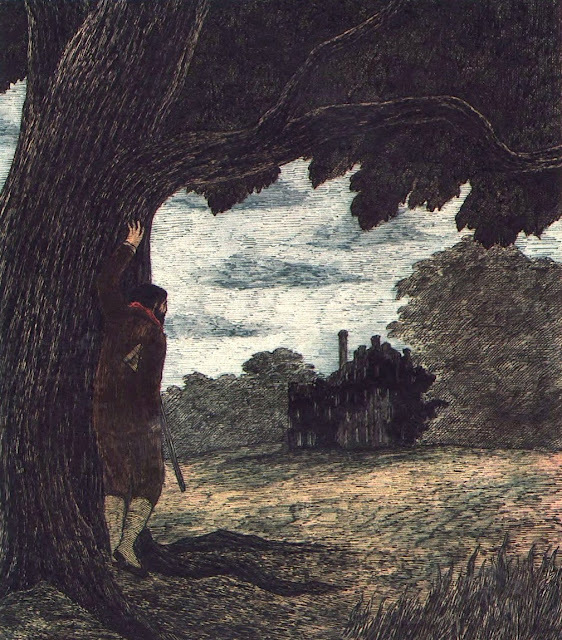 "The Attempt on St. Mary's Branch." 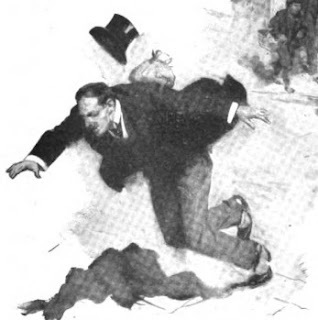 Illustrations by Cyrus Cuneo, R.I.
First appearance: The Strand, December 1912. Reprinted in the January 1913 issue. Short short story (7 pages, 3 illos). "Unsupported by any visible agency, it appeared to be behaving in flagrant defiance of the law of gravitation." 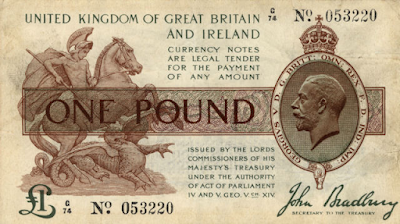 —you could say, with a certain flair; take that floating bag of gold sovereigns, for instance . . .
"It was a fine shot and a lucky one . 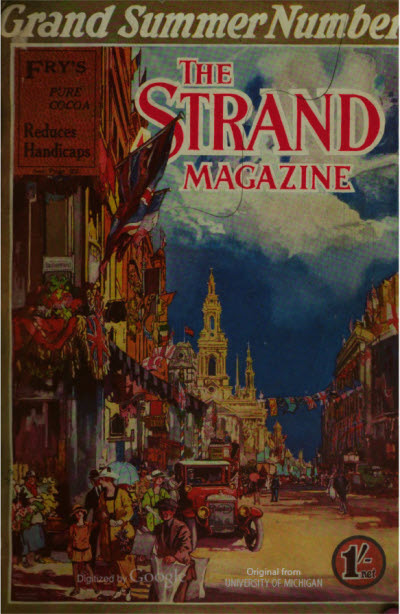 . ."
First appearance: The Strand Magazine, July 1919. Short story (10 pages, with 6 illos). ". . . he was fresh from a sphere where the ethics of killing did not concern him." Cool customers, these bank robbers, but they never reckoned on the power of love . . .
far as can be determined) in 1928. 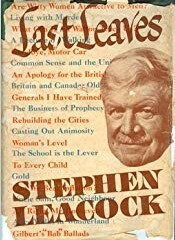 - It might be instructive to compare the tone of Steevens's first story about a bank job from pre-War 1912 with the second one from post-War 1919. 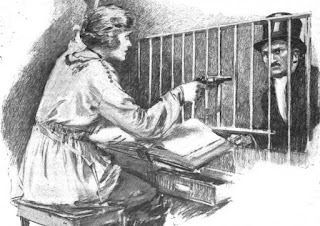 - In "The Service Revolver," mention is made of "the forged Bradbury"; see the Royal Bank of Scotland's article (HERE) for full details. 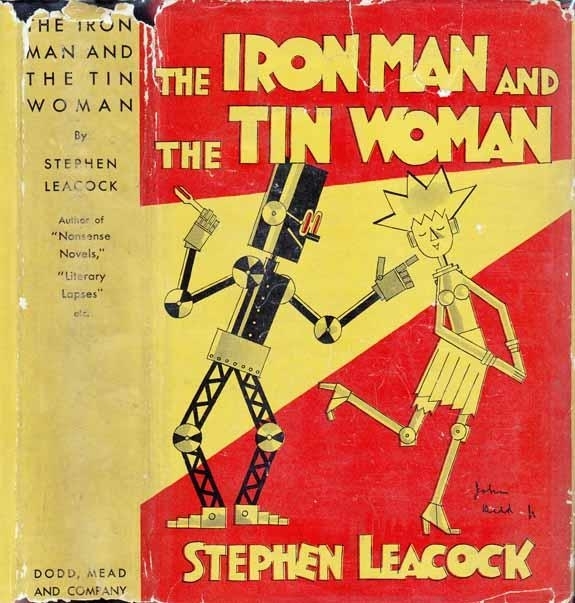 "When He Told the Police Who I Was, They Hit Me Over the Head with a Police Club Till I Was Quiet and Then Gave Me Some Coffee"
Collected in The Iron Man & The Tin Woman: A Book of Little Sketches of To-Day and To-Morrow (1929). Online at Faded Page (HERE). "The brachiocephalic index of nearly every one of them was of a kind to alarm the police force, while the facial angle of those who had the hardihood to show it justified immediate arrest." Biometric analysis can certainly be useful—if it's done by people with no preconceptions . . .
"However, nothing would do me but loafing around with a loose crowd of boys and talking about this man or that who’d made a clean-up as a plumber or garage man or a dry cleaning explosives expert, and never got caught." He really shoulda listened to his muddah . . .
"Oh, yes, sir. What would you like, sir? We could give you a cold chicken, a made-up salad, sir, with a cold meat pie, if you care for it." Ah, those lazy, hazy, crazy days of summer, when even murder must take a backseat to excellent brook trout . . . Collected in Last Leaves (1945). Short short story (5 pages). "I am a great reader of detective fiction. That is, I have been up to now, but I see I shall have to give it up." If you're unwilling to chance contracting a case of full-blown paranoia, then by all means follow our narrator's example . . .
Pretend it says 7:01 . . . and ¼. 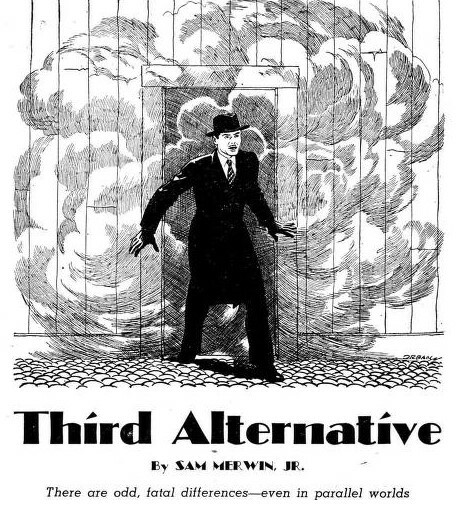 "By the Time the Police Get Through Questioning You You'll Be Meat for the Nut-hatch, Friend"
By Sam Merwin, Jr. (1910-96). 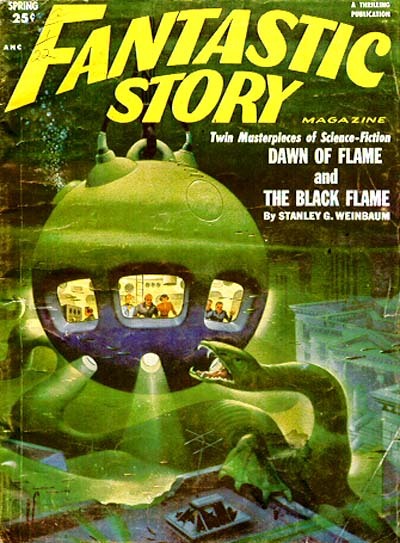 First appearance: Fantastic Story, Spring 1952. 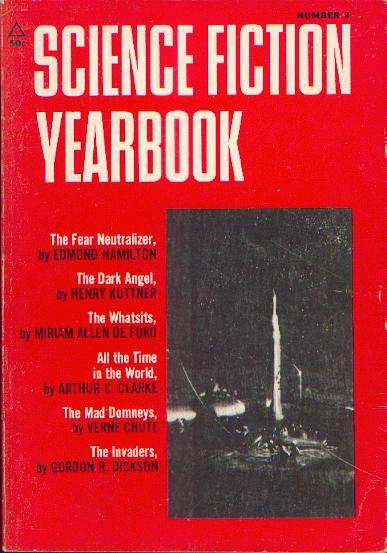 Reprinted in Science Fiction Yearbook, No. 2 (1968). Short short story (8 pages). "There was a third alternative open to him." Personally, we don't believe in the multiverse (for one thing, its existence is unprovable as a practical matter); imagine, though, the complications—political, legal, and personal—that would result from such a thing. To save us the trouble, Sam Merwin has already imagined it, and the prospect isn't all that good for one man, a murderer who keeps seeing his victim everywhere, alive and well . 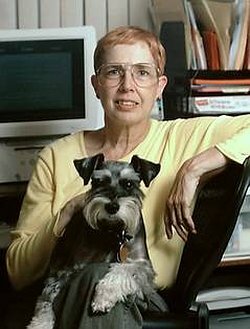 . .
- Read all about Sam Merwin's accomplishments in the SFF genre (HERE; Wikipedia), (HERE; the SFE), and (HERE; the ISFDb). Our previous encounters with him can be found on this page (HERE). "The multiverse (or metaverse) is a hypothetical group of multiple separate universes including the universe in which humans live. Together, these universes comprise everything that exists: the entirety of space, time, matter, energy, the physical laws and the constants that describe them. The different universes within the multiverse are called the 'parallel universes', 'other universes' or 'alternative universes.'" 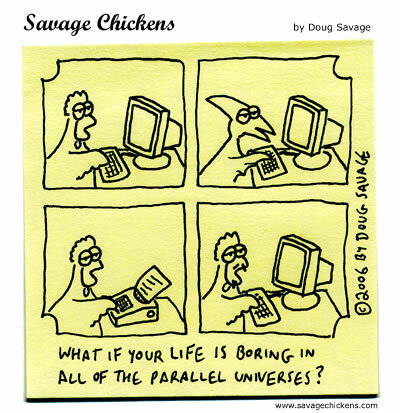 See also the SFE theme entry on parallel worlds (HERE). - It might be an illusory notion, but the multiverse has been a boon to SFF authors like Merwin (and daydreaming theoretical physicists fishing for research grants), all of them exploiting it shamelessly ever since the idea first bobbed up; see the short "Multiple Timelines" section of Atomic Rockets (HERE) for still more. "The Man They Wanted Her to See Was Slumped Face Down Across His Desk"
By Lee Killough (born 1942). First appearance: Stellar 5 (1980). to page 100; then use Full Screen button). "Death was a hell of a thing to start Monday." examined her, and she's not only merely dead, she's really most sincerely dead." as Dr. Dallas March, the coroner of a nearby town, discovers when she does a postmortem: "Dr. Morgan," she declares, "is the deadest man in medical history." Indeed, because it's impossible as a practical proposition for any preserved corpse to be that dead and because the police, lacking her expertise, don't see anything sinister in the case, Dallas initiates her own little investigation, which will, among other things, have her trying to find out just what the untimely demise of three rats has to do with the very late Dr. Morgan shuffling off this mortal coil . . .
". . . his face was peaceful, not distorted as it would have been after an agonal struggle. However he had died, death had come unexpectedly and unfought." 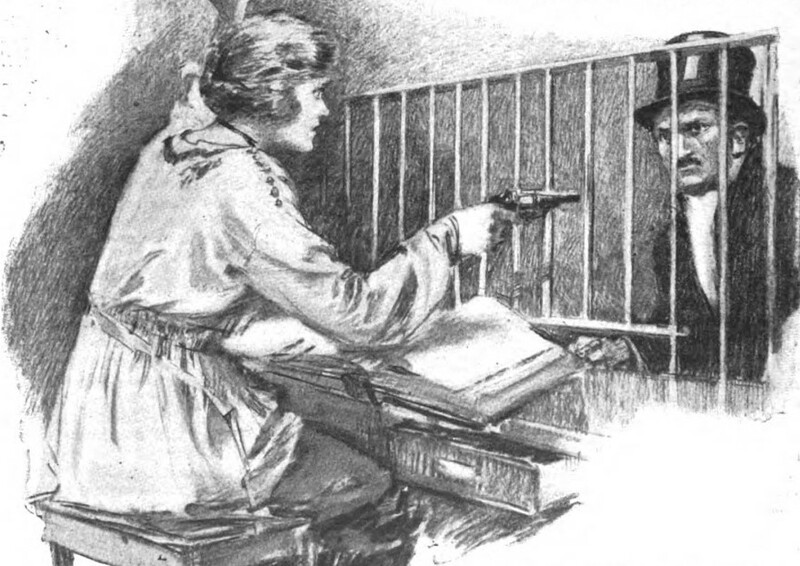 "Dr. Morgan's death bothered her more than most. Rigor gone but decomposition still minimal? That was most peculiar, and disturbing." 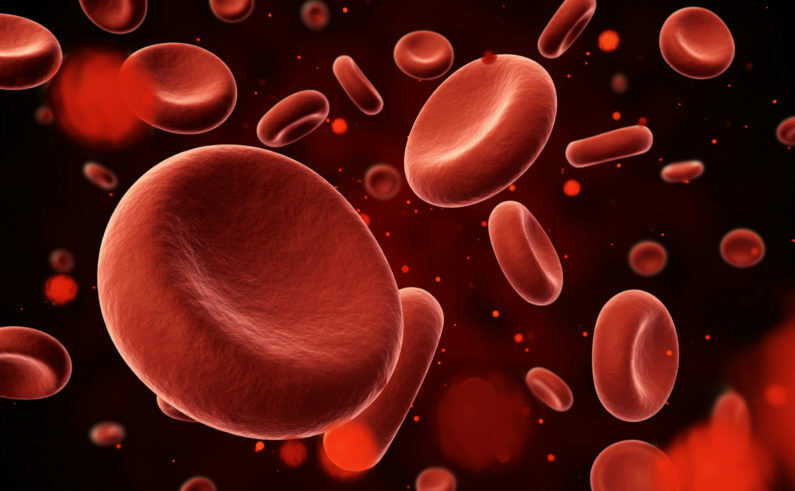 "She finally recognized the tunnels as blood vessels when Death skimmed by her in a surfing position on an erythrocyte." "Isn't one dead rat like another?" "That's the way they come in pathology, sweetie." "We never were able to determine exactly why they died . . . but they exhibited the same findings your patient does: broken DNA, wavy actin and myosin, and no living internal bacteria." "That's why it was such a shock to find him there like that when I turned the light on." but I'm not about to let you talk me into a murder investigation." "I think I did something wrong." for now; see Wikipedia (HERE) for background. 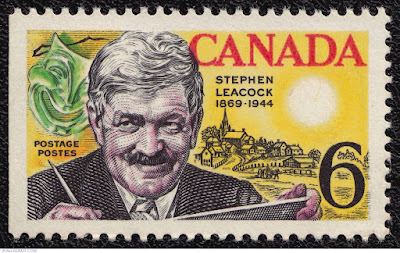 "It Is Not So Much the Crime Itself That Attracts As the Unraveling of the Mystery by the Super-brain of the Great Detective, As Silent As He Is Efficient"
FOR FAITHFUL READERS of this weblog (and, to be serious for a moment, we really do appreciate you), Canadian polymath and humorist Stephen Leacock needs no introduction. Our experience is that somewhere (or several somewheres) in one of his pieces the reader won't be able to resist laughing out loud, something that can't always be said of every writer wearing the label of "humorist." Today Leacock returns to one of his favorite themes . . .
Chapter (10 pages as a PDF) in Short Circuits (1928). Online at Faded Page (HERE; go down to page 203). 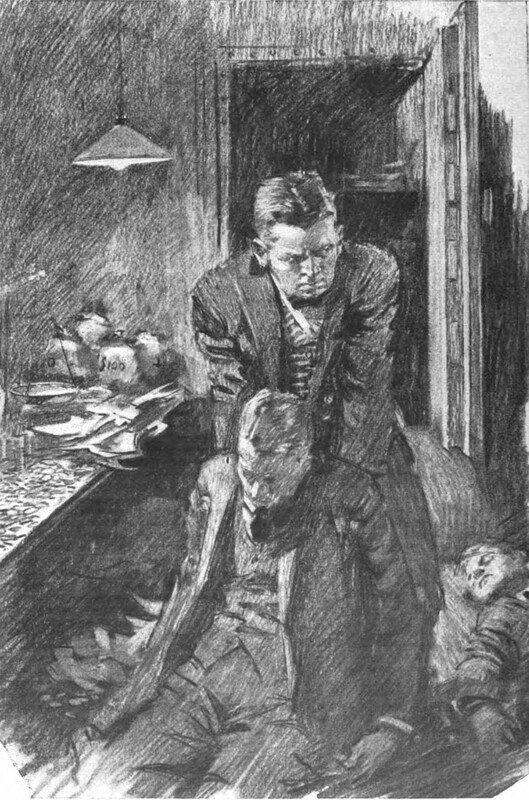 "The tempting point about a detective story—both for the writer and the reader—is that it is so beautifully easy to begin. All that is needed is to start off with a first-class murder." 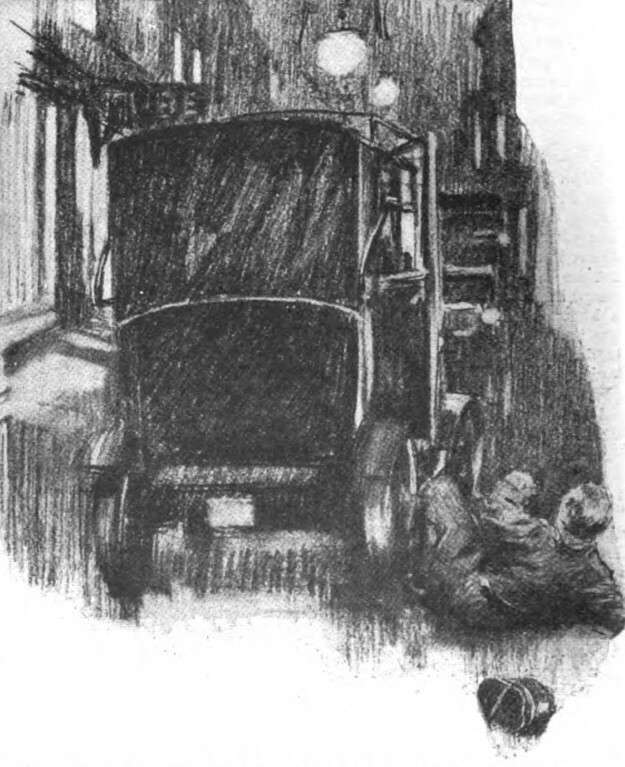 Chapter IX of Sunshine Sketches of a Little Town (1912). Online at Faded Page (HERE; go down to page 187). "But apart from the general merits of the question, I suppose there are few people, outside of lovers, who know what it is to commit suicide four times in five weeks. 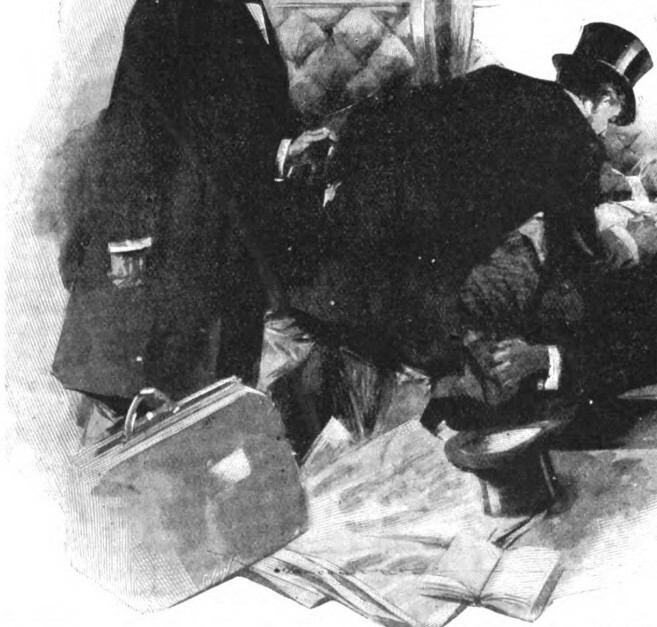 Yet this was what happened to Mr. Pupkin, of the Exchange Bank of Mariposa."
. . . and what, you're probably wondering, do Mr. Pupkin's multiple suicides have to do with a bank job? Read on, Macduff . . .
- Previous ONTOS encounters with Stephen P. H. Butler Leacock can be found (HERE) and (HERE). "My Admiration Is Reserved for the Detective Who Detects, Whose Claim to Fame Is His Mind Rather Than His Way with a Girl or a Jury"
writer introduces interplay of character at his peril." The very same could be said for detective fiction. While he was lionized by the Literary Establishment for such mainstream efforts as Lucky Jim (1954; the one he's most remembered for in Academia) and condemned by the same people for his political views, he never lost interest in what he regarded as the minor genres, including SFF and crime fiction, producing such works as The Anti-Death League (1966), The Riverside Villas Murder (1973), and The Crime of the Century (1975), as well as his own idio-syncratic take on James Bond (Colonel Sun, 1968). 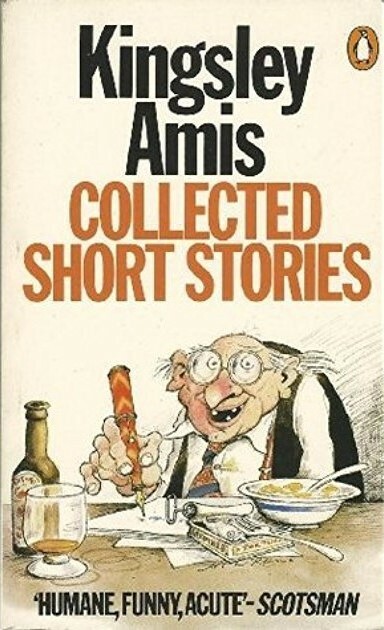 Collected in Collected Short Stories (1980). Reprinted in The Big Book of Sherlock Holmes Stories (2015). Filmed for TV (IMDb HERE). Online at The Luminist League Archives (HERE; scroll down to page 226). "Thus it was that events conspired to embroil me in what I must describe as a truly singular adventure." what this story is all about. Typo: "would have stolen hat weapon"
First appearance: Where - unknown; when - 1966. Reprinted in What Became of Jane Austen? And Other Questions (1970). Online at The Luminist League Archives (HERE; go down to page 108). - Nicolas Freeling (". . . one of the most promising arrivals on the post-war crime-fiction scene . . .") and Van der Valk (". 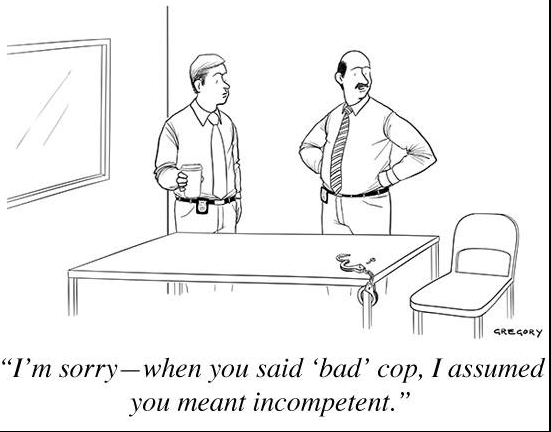 . . very much a real policeman"). - Inspector Maigret ("None of those brilliant intuitions, those miraculous leaps in the dark, those questions about what seem to be insanely irrelevant matters, that are so firmly in the middle of the great detective tradition inaugurated by Poe's Auguste Dupin"). which I would defend hotly"). - Erle Stanley Gardner and Perry Mason (". . . Mason has an impressive claim to being considered the most boring foe of criminality in our time . . 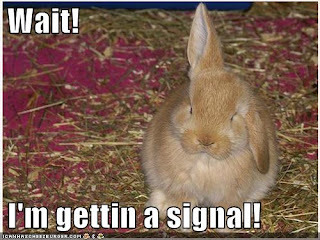 ."). - Arthur Conan Doyle, Dr. Watson, and Sherlock Holmes ("The magnifying lens and the dozen red roses belong to different worlds"). - Edgar Allan Poe and Dupin ("Apart from his irritating mannerisims, all three of Dupin's cases are very shaky"). 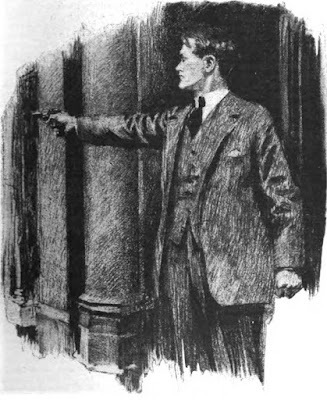 that Wimsey is no more of a fag that Holmes is: he merely looks and sounds like one . . ."). the two Agatha Christie characters, both of whom seem straight out of stock—Poirot the excitable but shrewd little foreigner, Marple the innocent, helpless-looking old lady with the keen blue eyes"). - Ellery Queen ("Ellery of the silver-coloured eyes is seldom much more than an extension of the plot"). his own kind of adventure"). Goodwin ("The weakness of Stout's hugely readable stories is always the story. . . .
two dozen times in all, and this author is a first-rate artist"). 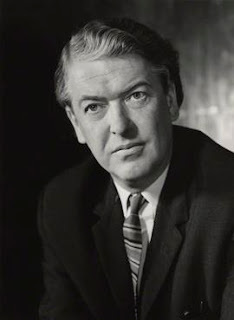 - Like a lot of other writers, Sir Kingsley William Amis was done in by chronic overdoses of booze and babes; see Wikipedia (HERE) for details. - Amis's involvement with SFF is chronicled (HERE; SFE) and (HERE; ISFDb). 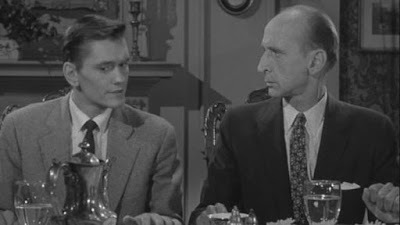 - No surprise that Lucky Jim wound up on television as both TVMs and series (HERE). "I'll Be Lucky If, After These Other Cops Get Through Making Out Their Reports, Anybody Knows I Was Even on the Case"
". . . the water spread out over the uneven, cracked concrete and then gathered into several small puddles and one larger one." 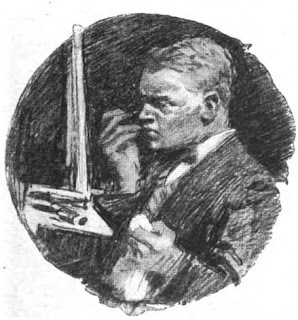 Illustration by Frederic Dorr Steele (1873-1944; HERE). First appearance: Collier's Weekly, November 29, 1930.
as "Green Paint and Neat Knots" [FictionMags data]. Short short short story (2 pages, 1 illo). Online at UNZ starting (HERE) and finishing (HERE). "Meet Detective O'Malley, who will show you how a big-town sleuth actually goes after his man." how knots have been tied, and the way water can behave when it's poured on the floor. "He was found in Manhattan, so we'll start in Brooklyn; if he'd been found in Brooklyn we'd do the other way about." First appearance: Collier's Weekly, December 13, 1930. 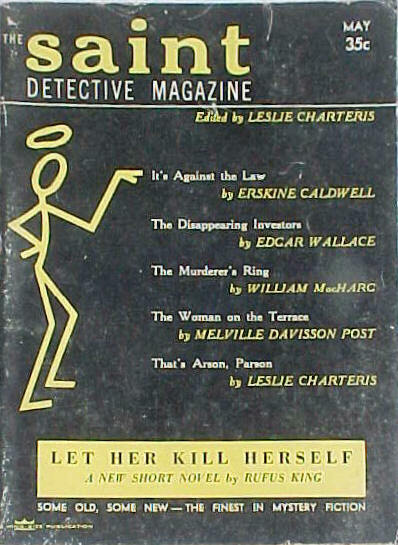 1956 as "The Murderer's Ring" [FictionMags data]. "Wherein Detective O'Malley sets an ingenious trap and tests the truth of that popular saying: 'It pays to advertise.'" 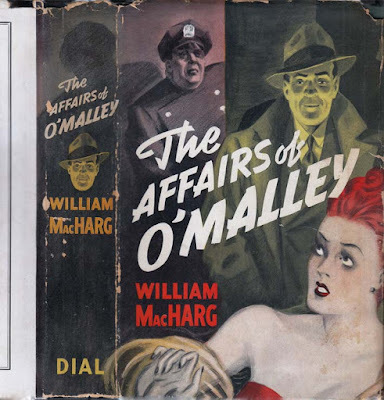 Something as unpromising as a theater ticket stub in a dead man's pocket can prove useful in a murder investigation; for O'Malley, though, that ring is the icing on the cake . . .
"Matter-of-fact New York cop solves thirty-three murders in short order. Crisp, straight-to-the-point short stories briskly written and ably plotted. Verdict: Hors d'oeuvres." If you want a first edition, Yesterday's Gallery & Babylon Revisited has one for a cool grand (HERE). 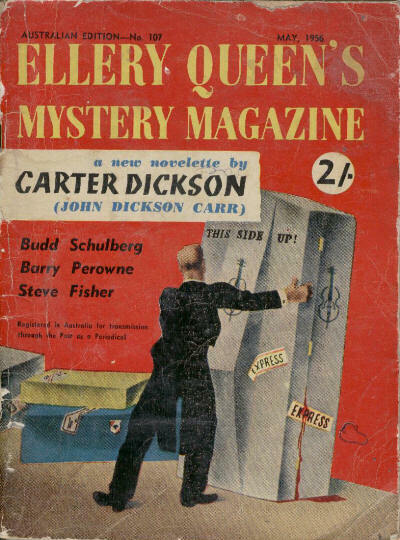 "Each Time He Went Step by Step Over the Mechanics of the Robbery, It Seemed More Gemlike and More Work-able"
First appearance: Collier's, May 3, 1952. EQMM (U.K.), March 1956; and EQMM (Australia), May 1956. 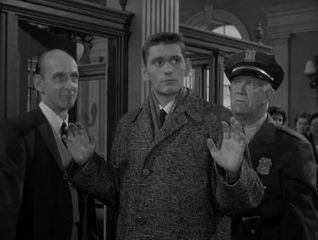 Filmed for the Alfred Hitchcock Presents TV series (1959; see HERE: SPOILERS). 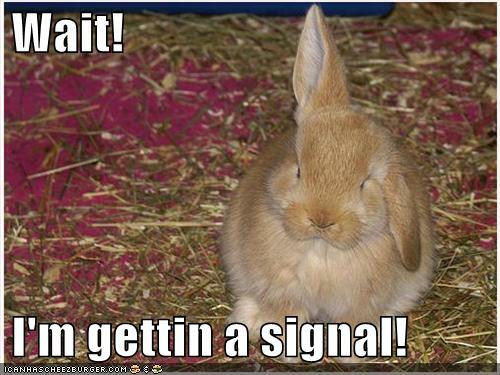 Online at UNZ starting (HERE) and concluding (HERE; scroll down to page 70). "There was no flaw in Logan's plan for revenge. He had calculated cleverly, rehearsed every move. Tritt was vulnerable—weak, vain, and smug—and Logan would turn his self-righteousness against him." 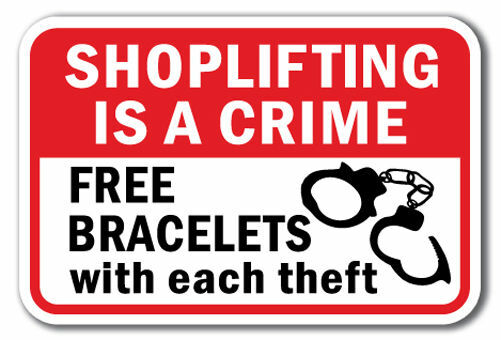 Weak, vain, smug, and self-righteous he may be, but is William Tritt really the thief that Norman Logan thinks he is? Don't be too quick with your answer . . .
- What biographical data we could locate about Harry Miles Muheim comes from the Internet Movie Database (HERE). "You See, I Had To Get It at Any Cost"